When SUPERNATURAL returns for its 14th season in October, the Winchester brothers are facing a new challenge: Dean’s (Jensen Ackles) body is being controlled by angel Michael, and it’s up to Sam (Jared Padalecki) and co. to find him. But unfortunately for Sam, he also has to contend with the group of people they were able to save from the Apocalypse World. Zoinks! SUPERNATURAL is crossing over with SCOOBY-DOO in the March 29 episode of The CW series. 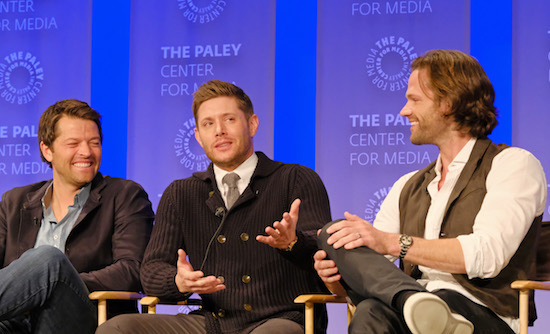 “Scoobynatural” had its world premiere at Tuesday’s PaleyFest, and fans weren’t the only ones watching the hour for the first time—series stars Jared Padalecki (Sam), Jensen Ackles (Dean), Misha Collins (Castiel), and Alexander Calvert (Jack) also saw the finished product. With Darkness (and Amara) loose in the world, the Winchester brothers are in for quite the fight on SUPERNATURAL. But for the first time in seasons, the duo is actually working in tandem from the start. “They’re fighting alongside each other,” Jared Padalecki (Sam) added. We’re just one day away from SUPERNATURAL’s 200th episode, and the hour — which SUPERNATURAL showrunner Jeremy Carver called “a love letter to the fans” — is one of the most meta-filled installments of the series. Over 199 episodes, SUPERNATURAL has introduced monsters, demons, angels, and so many things that go bump in the night. But, of course, some stand out a little bit more than others. It’s no secret SUPERNATURAL season 10 will feature Demon Dean, but Sam will have his own arc to contend with: he’ll go to some potentially dark lengths to save his brother from his demon instincts. 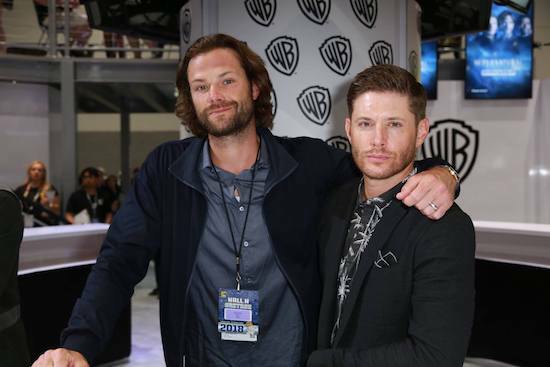 SUPERNATURAL is returning to Comic-Con to celebrate its tenth season, and its stars and executive producer will be on hand in Hall H to talk about the show. I’ll be live-blogging everything that goes down starting at 10 AM PT, and in the meantime, here’s the official panel description..
It’s SUPERNATURAL-meets-THE WIZARD OF OZ in the upcoming episode, “Slumber Party,” and thankfully, Sam and Dean won’t be on their own as they have to try and wrap their minds around it: they’ll have the help of Charlie (returning guest star Felicia Day)! “Dean kind of tries to battle with the fact that there’s an actual Wizard of Oz, and there’s an actual Dorothy, and it’s all being unfolded in front of him,” Jensen Ackles (Dean) added later in the video. The SUPERNATURAL cast and producers hit up Comic-Con on Sunday, and after their panel (which we live-blogged), they participated in a signing for fans.